Pears, Walnuts and Gorgonzola cheese are a classical combination for a salad. I scattered them on some Mesclun leaves and drizzled them with a mixture of three parts of walnut oil to one part of white balsamic vinegar. Freshly ground black pepper and salt were added to taste. I crumbled only a little of the Gorgonzola into the salad as a larger amount makes this salad too heavy and rich for my taste . But I did use plenty of freshly toasted walnuts and sliced pears. Fried boneless chicken thighs were served alongside. This week I am playing with a bottle of Uncle Joe's walnut oil. 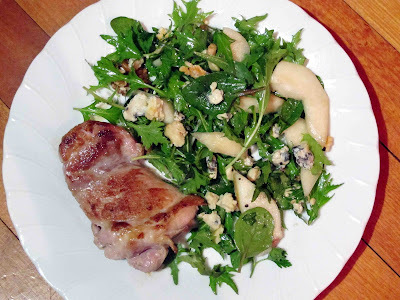 I think its mild, nutty flavour worked really well in this salad . There's still some left in the bottle so I'll post some more recipes as I create them.